A skinning knife is invaluable to the big game hunter, and a good one gets a lot of use. I predict this Bark River JX-6 will be very popular. I gutted the whitetail doe with an L.T. Wright Large Northern Hunter, and the knife did a great job. But I did most of the skinning with the Bark River JX6 Companion. Designed primarily as an every day carry knife, I had also used the JX-6 successfully on a duck. As far as I’m concerned, this knife design is worth looking at. 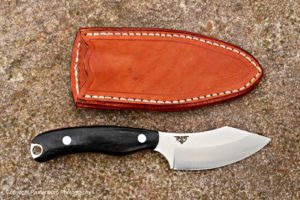 The JX6 Companion knife is designed by Chris Tanner of Prepared Mind 101, according to the Knivesshipfree.com website. It is a smaller version of the JX4 Bushbat and is made without the finger ring. The JX-6 is a well-designed user knife. The blade has the same Tanner-style cutting curve but is ground higher to maximize the cutting power of the smaller blade. The profile of the handle gives an extremely secure grip no matter how you hold the knife for any task. 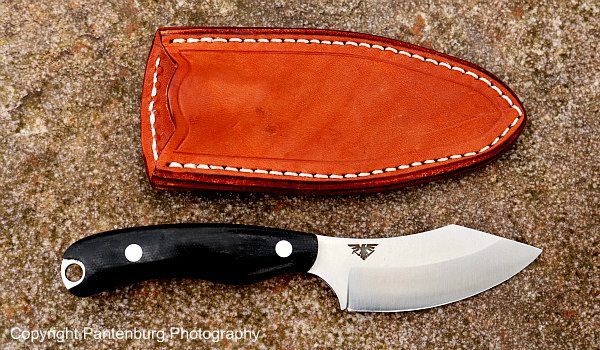 Knife users will recognize the influence the Grohmann Knives in Nova Scotia, Canada, had on the design. That design, according to my research, apparently goes back to the original Nessmuk knives. The design also appears to have been influenced by the Canadian leaf style blade. Even thought the design is modern-looking, the blade definitely has some time-tested, reliable features. As soon as I got the JX-6, I started using it for everything. It was an OK kitchen knife, but the blade was too short to make it a really good slicer. The thin blade worked well for cutting melons and apples, and it was an adequate kitchen knife. I wouldn’t want to peel many potatoes with it. It whittles and carves wood nicely. But this knife is designed to be used in the field, so that’s where it went. It rode in my hunting daypack most of the season. But hunting season success can vary widely from year to year, and this last one was not that productive for me. My nephew brought me a duck to clean, but the waterfowl season down south this year was pretty lame. The weather was too warm up north to send the migrating flocks down to us, so nobody in my circle of duck hunters harvested many waterfowl. That’s the excuse we’re using anyway. You have to see ducks before you can hunt them. But I put the JX-6 in my deer hunting daypack, expecting to harvest several whitetails. Again, the best laid plans… the swamp I usually hunt was soaked with unusual amounts of heavy rain, making access a real problem to some of the areas. Despite the sloppy roads, inaccessibility and mud, I did manage to kill two whitetail does, and field test several knives. So after the Large Northern hunter did the gutting on one of the afore mentioned deer, the JX6 was put to work. 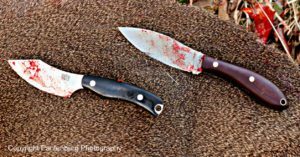 It proved to be a superior hunting knife, and a real skinner. The JX-6 and L.T. Wright Large Northern Hunter handled a whitetail doe very easily. Steel: The knife never needed sharpening during or after skinning the deer, and this was after processing a duck, kitchen duty and wood carving. The CPM154 steel showed excellent edge-holding ability and you can leave the sharpening gear back in camp when you take this one out. The steel also appears to be really stain resistant. I deliberately left the blade bloody overnight after working on the deer carcass. The next morning, the steel cleaned up easily, with no apparent staining. Grind: The blade has a full convex grind, which is my favorite. After trying different grinds on a variety of bushcraft tasks, I choose convex over all others. Here is why. Handle: The shape of the handle has a slight palm swell so that it is virtually self righting in the hand without having to look at it. This is a good knife to use inside the abdominal cavity of a large game animal. Micarta, in my experience, gets tacky when wet, and makes the handle less slippery. That is important on a knife that might be used on some bloody jobs. I try out any hunting knife while wearing cut resistant gloves over latex gloves . The handle must be usable and safe under a variety of conditions, and this handle design is excellent. Spine: The spine has a definate angle to it that keeps the point from piercing the entrails when doing that initial spine down, edge up cut that opens up the abdominal cavity when field dressing a deer or other big game animal. That, plus the point location makes this a superior hunting knife. The JX6 works well on small game as well as larger animals. Its convex grind also makes it good wood carving tool. Blade thickness and length: The .125 thickness is about right – not too thick, but thin enough to be a good skinner/slicer. Personally, I’d prefer the blade a little thinner, say to about .1, but that’s just my preference. I don’t anticipate any situation where there might be a lot of lateral, twisting pressure put on the cutting edge, which might call for a thicker blade. Sheath: The JX-6 comes with a sturdy leather sheath that protects the edge and the user. I added D ring to the back, so it could be carried as a dangler, and wet formed the sheath. These were personal preferences. Made in the USA: All Bark River knives are made in Escanoba, Michigan by skilled American craftspeople. They earn a living wage and pay local, state and federal taxes. Bark River also pays corporate taxes. These folks contribute to their communities. Buy American! So, do you need a JX-6? As a small game knife, the blade is a little too long and wide for my preferences, but it can get the job done. 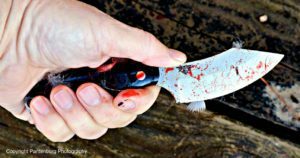 On rabbits and squirrels, there’s not that much skinning anyway, and as always, skill is the first factor in a knife’s effectiveness. It is not the best survival knife, nor would it be the best choice for the best bushcraft knife. But the Jx-6 does many things well. The JX-6 probably shouldn’t be the only knife to take on a deer hunt, but it is one that shouldn’t be left behind.